Our two little sleeping beauties had another doctor's appointment today for a weight check. Avery has leaped to 6lbs 13oz and Olivia is now 5lbs 12oz. Dr. Arani was very happy with their growth and has no concerns. 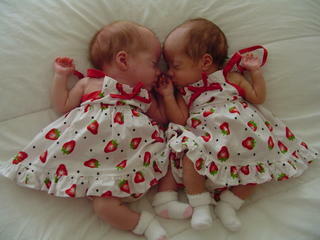 Our preemies are not so preemie anymore. They're getting bigger by the day. This picture here of Olivia's arm was taken back on July 3rd 2005. The nurses thought it would be a good idea to get a picture of daddy's wedding ring around Olivia's arm before she got to big. This gives you a good idea of how small they actually were. Shannon's mom showed this picture to one of her friends and she thought it was a bracelet. When she was told it was daddy's wedding ring she started to cry. Well those days are behind us now but we thought this picture would be cute to share with everyone. Olivia & Avery's first picture together. The twins are home at last. Avery arrived home on Tuesday September 6, 2005 weighing 5lbs. 9oz. and Olivia on Thursday September 15, 2005 weighing 5lbs. 4oz. 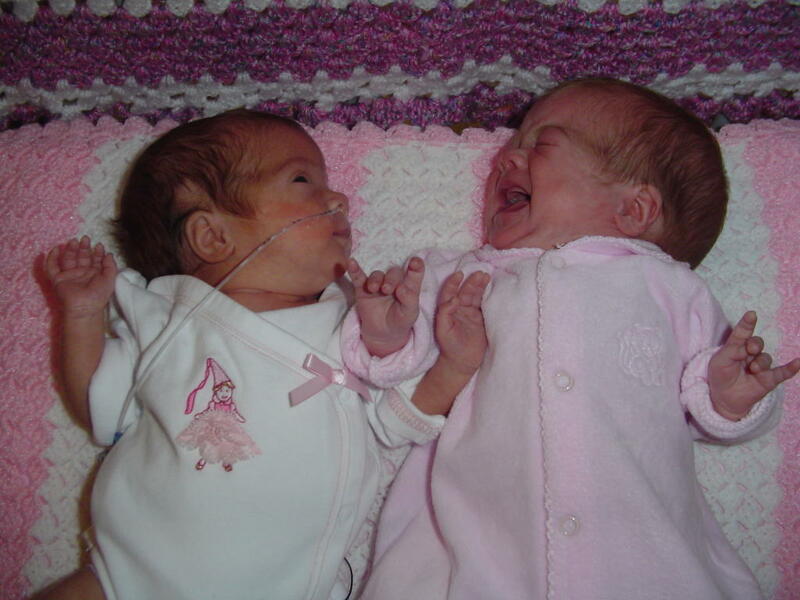 Olivia and Avery were reunited on the exact day that they were expected to be be born. Having Avery home a whole week before Olivia came home gave us a chance to feel parenthood for the first time, but nothing could prepare us for the sleepless nights that lie ahead once Olivia arrived home. Avery has been feeding very well and gaining weight each day. Olivia has also been gaining weight every day but she is having difficulty with her feeds. In a week or so we should see dramatic improvements. Olivia had her first doctors appointment today with Dr. Arani and she checked out fine. She has gained 3oz. in four days and they are both scheduled for another check up on the 26th. We'll keep everyone posted on their progress.